Grandview Terrace gives special attention to the details that offer a next-level style of resort living—and the dining options are no exception. The exciting dining experience offers culinary indulgence reminiscent of what you would encounter at a five-star resort. Residents have the option of choosing from a variety of dining experiences for every meal, whether it be fine dining or quick and casual. 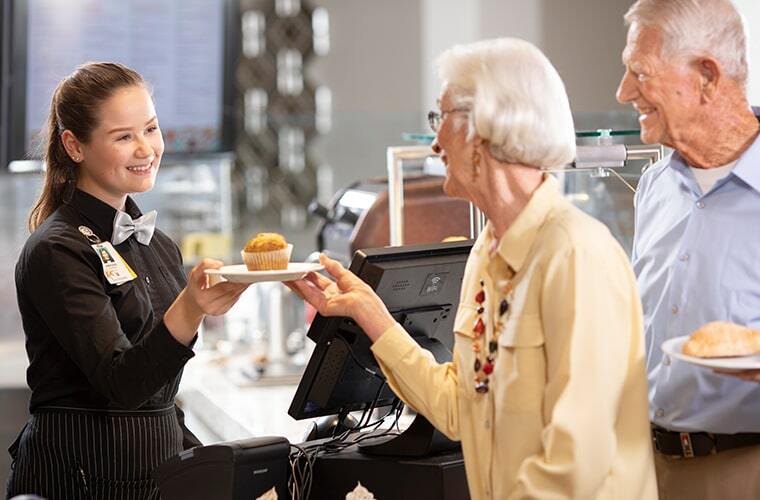 Gluten-friendly options and health-conscious fare, such as low sodium and low sugar menu items, help the dining experience accommodate a wide range of dietary preferences. 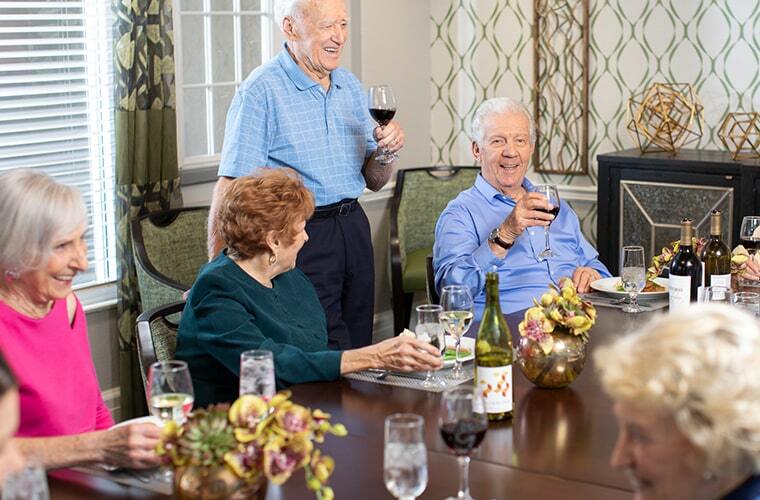 Guests are invited to share the Grandview Terrace dining experience with residents and family. They may also reserve a private room for birthdays, anniversaries, and other special occasions. Grandview Terrace offers three casual dining areas: The Marketplace, The Greens, and The 19th Hole. Each offer a unique view of the community’s open concept kitchen, filled with a pastry counter, a brick oven made for tasty wood-fire pizza, and more. Monday – Saturday: 7 a.m. to 7 p.m.
For a more elegant dining experience, Grandview Terrace offers three formal dining rooms: Sabino, Fireside, and Sonora. Open for dinner and Sunday brunch, these newly-renovated dining areas include an upscale fireplace and deliver an experience similar to what you’d find at a five-star resort. Monday – Saturday: 4 p.m. to 6:30 p.m.
Grandview Terrace’s private dining rooms, Desert Breeze and Hidden Cove, offer the perfect setting for small gatherings and special occasions. Both private dining rooms are available for reservations. Residents can enjoy their meals outside on either of Grandview Terrace’s outdoor patios: The Northview Patio and The Garden Patio. Both include exceptional views of the golf course and are open when weather permits. 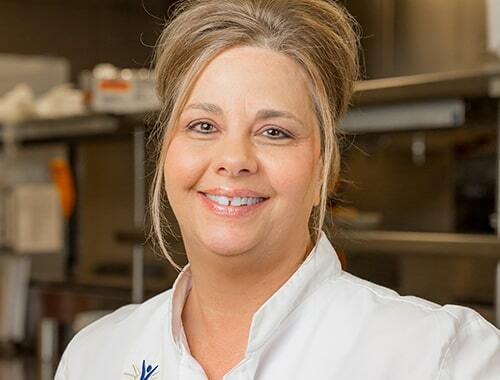 Executive Chef Tracey McCarthy has been part of the Sun Health Communities team for the past 2.5 years and has 33 years of culinary industry experience. She previously apprenticed under nationally recognized and top Milwaukee Chef, Sandy D’Amato, and received her Culinary Certification from the Milwaukee Area Technical College. Chef Tracey began her culinary journey as a Culinary Director for 15 years, before becoming Sous Chef at the age of 21. After just four years, Chef Tracey accepted the role as Executive Chef at Grandview Terrace. In addition to her role as Executive Chef, Chef Tracey has owned and operated Sensations Catering, LLC for the last eight years. With her rustic styles and “farm to table” principles, Chef Tracey finds inspiration for her cooking through her family roots, and believes the freshest ingredients create the best food. She loves spending Sundays in the kitchen with her mother and picking the freshest fruit and vegetables from their family garden. Chef Tracey’s favorite part about being a chef is the creative process. She loves being able to express herself through the food she prepares and is passionate about creating memories through food that will last a lifetime.